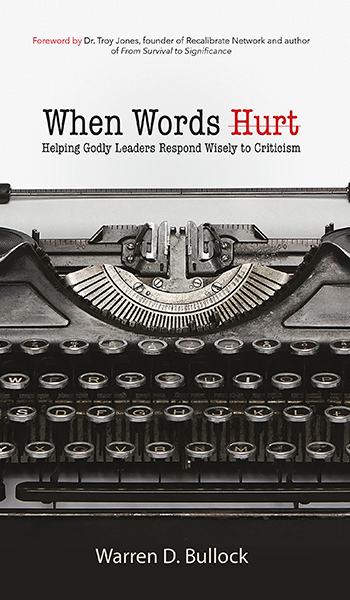 Warren D. Bullock, When Words Hurt: Helping Godly Leaders Respond Wisely to Criticism (Springfield, MO: Salubris Resources, 2016). Ministers receive more than their fair share of unwarranted affirmation. When was the last time, for example, you launched a stinker from the pulpit but still got a “Good sermon, Pastor!” from one of your congregants on their way out the front door? We get praise we haven’t deserved. By the same token, we get blame we haven’t deserved too. When was the last time a deacon chewed you out for an expenditure in the church budget, conveniently forgetting that they had voted in favor of it? Or a first-time visitor harrumphed at you because you didn’t immediately indicate agreement with their laundry list of “helpful suggestions” for improving the ministry of your church? And then, of course, there are the times we received criticism the old fashioned way—by earning it. The neglected pastoral visit at a crucial time in a family’s life. The angry response when a soft word would’ve worked better. You get the idea. Whether deserved or undeserved, criticism hurts. “Sticks and stones may break my bones,” the old saw goes, but we all know that the second half—“words will never hurt me”—is a lie. Words hurt. Sometimes, they hurt so much they leave permanent scars on our lives and our ministries. When we are criticized, the person who least deserves grace is the critic. And that is precisely the point. We offer what they don’t deserve in the same way God offers it to us. As grace has liberated us, so responses filled with grace will bring freedom and release to both the criticized and the criticizer. A good insight from a grace-filled book!